When World War II was over and the Allies were figuring out which country would be responsible for oversight of which sections of post-war Germany, it made perfect sense for the French sections to include the Rhine Valley along the border the two countries shared. Strategically, the valley had been passed back and forth for generations. Hiking through the foothills of the Black Forest one frequently passes the foundations of cannon batteries as well as the gun turret pillboxes from that last militarized conflict between France and Germany. As part of the arrangement, the French built out a military complex at the edge of the city of Freiburg after the war. The complex was named after the French general Vauban and built to house garrisons, complete with a Panzerplatz for tank training exercises. Ultimately abandoned as the 20th Century was drawing to a close, portions of the Gelände were usurped by squatters and gypsies. By the time I arrived there for a year of study abroad during college, a number of the old garrison buildings had been retrofitted for university student housing. The renovations were minor in most areas: the parking lot remained unpaved, which meant mud galore after any amount of rain; the flagpole of the parade grounds stayed put, so there was always a central gathering point for the students if needed; and I hung my coat in the old rifle racks, which often helped me put stress from tests and homework into perspective. The magic of the place was that not all of the buildings were renovated for student housing. A number of the buildings remained “in control” of the gypsies. I never thought of them that way, even though a good percentage of them also lived in these retrofitted jeeps, buses and old army trucks. For me these people were artists. And the music, talk and “feel” of Vauban carried their energy. In the years since I left Freiburg, portions of the old Vauban have been renovated yet again. Some of the artists surely remain. But in place of some of the others who have left, the city built something else with energy in mind: a sustainable neighborhood. The Solarsiedlung is the epitome of ecologically-minded urban planning. From the rooftop solar power, to the rainwater collectors, to the construction materials and even the transportation system. The vibrancy of Vauban–both what I experienced as well as what the Solarsiedlung represents–is what comes to mind when I think about what Minneapolis might do with the old Fort Snelling property. According to this http://www.startribune.com/local/west/123203993.html”>article in the Star Tribune, there’s talk within local government about what Minneapolis might do with this large piece of underutilized property. Although we didn’t have foreigners occupying our own military grounds at the Fort, the similarities a Minneapolis project would share with Vauban are striking. Both properties were former military sites. Both properties were already seeing their lands used during the interim period between military and city development. Both properties were conveniently located from a transportation standpoint. Both properties had unique landscape features nearby. Both cities have a strong cycling culture. Could we have a bit of competition at hand? I would LOVE to see us outdo the Vauban Gelände. As promised in a recent post I had a third write-up to offer from last week’s trip. Like that second post, this one’s also about mobile tagging. Unlike that second post, this one has a positive spin to it. When I go to client meetings I always make it a point to bring my business cards. It’s just one of those things I was trained to do when I first started in this business. And yes, I used to collect my dad’s business cards when I was a kid so maybe there’s a bit of nostalgia in me to carrying my own around. It probably isn’t very Mr. Interactive of me, given the means we have nowadays of sharing our contact credentials (see, for instance, the iPhone and Android Bump apps). It’s also not very Mr. Sustainability of me, but I digress. At some point on the plane ride out to Philadephia my cards must have fallen out of my bag. Because during the first wave of meet-and-greet introductions when I reached in, they were no longer there. Something similar had happened to my coworkers during Planningness last month and so the solution they used was top-of-mind: A QR Code of my social profile. I think I used the Zebra Crossing site and it worked fine given the circumstances, with a code generated off my LinkedIn profile. The code image screen grab saved to my phone’s photo album was then flashed to folks in the room during the rest of the meet-and-greets. If I were to find myself in a similar situation again, I’d probably follow in Chris Brogan’s footsteps and go with Pingtags if for no other reason than because they also tie in with LinkedIn while offering a better mobile phone interface. What’s your business card protocol? As May is about to wind down, it’s about time this blog published a post about National Bike Month. Because, well, May was National Bike Month. Were you aware of it? Plenty of organizations did something about it, beginning with the League of American Bicyclists and including my employer. 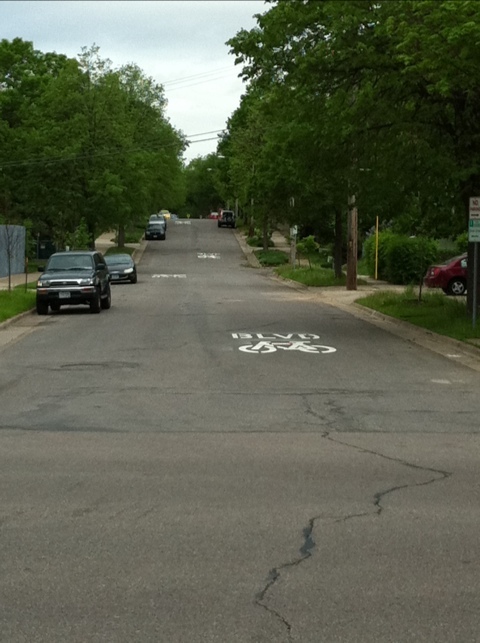 Thankfully, the City of Minneapolis has also been doing something about it. Here you see what I think are the finishing touches on “our” stretch of the Riverlake Greenway they installed at the end of last year. Now it’s striped where appropriate and road-stamped all along the route. It’s been awesome seeing an increase in riders from our dining room window the past few weeks. 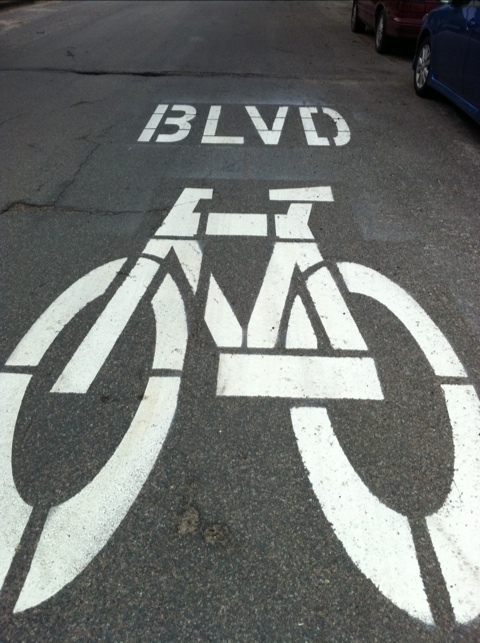 I’m a firm believer that the striping–and the Greenway itself–has contributed. Hopefully National Bike Month did too. Home Grown Power for Earth Day 2011? It’s Earth Day. There are no doubt tons of articles, posts, stories, etc. today about how fragile our collective spaceship really is. I believe that. But this ball of rock will last much longer than all of us. True, it’s the thin layer of water and air we need to worry about–but none of that is what I’d intended to post today. Instead, this is about an idea I had. An idea that had me kind of excited. An idea, however, that I won’t do anything with except for this post on Earth Day simply because I’m scared of messing around on my roof, to say nothing of how I feel about electrical wiring. What if those ball-shaped fans were coated on the inside with copper? And what if a magnet was placed into the “hollow” area inside those fans? Didn’t Mr. [Name Withheld For Privacy] in science class teach us that magnets and copper and movement generate electricity? WHOAH! Think about all the electricity you could generate on the roof of your home simply by letting hot air rise through those fans! I have no idea how much copper, or magnet, is needed, to generate an amount of electricity worth the hassle. Same thing for the speed required on those little turbines. But still, a fun thought on the right kind of day. Dolphins are cute and smart. Cows are big and dumb. The former should therefore not be killed for their meat. The latter, though, are fair game. Literally. I couldn’t help having those thoughts run through my head while watching the 2009 Oscar winning documentary The Cove last week. Admission #1: I’m completely late to the game watching the film. I first heard about it while managing the social campaign for Hopenhagen more than a year ago. At the time, it was garnering a lot of love not only for the story, but also for how it was marketed: a lot of support driven through social media channels. It had been in my Netflix queue all that time but, well, things happen. It finally showed up last weekend so that’s how I spent Sunday night. Admission #2: I eat meat. Of all mainstream varieties. But I’ve also strayed off the beaten path from time to time. One of those times had me exploring horse meat in Germany. The other, which is more pertinent to this post, was when I ate whale meat while on a trip to Iceland. Admission #3: I liked the movie. A friend thought it was the whole Indiana Jones element to the story. Ric O’Barry, the man who brought us the Flipper sitcom, literally, turns coat on the industry he helped launch. It makes for a perfect script: Ragtag band of misfits (military dude who builds helicopters, adrenaline junkie who scales skyscrapers for fun, Hollywood props master and the couple who free dives) subsequently team up to help Ric stop the dolphin slaughter in a tiny, hidden bay on the Japanese coast. As they face off against a team of bad guys (sinister government staffers misleading the International Whaling Commission, teachers feeding their children poisonous mercury-laden school lunches, vigilante security personnel with nicknames like Private Space and the hapless local police crew) you can’t help but root for Ric’s own Ocean’s 11. But the underlying message of the movie–that dolphins are smart and so should not be killed for their meat–still leaves a bad taste in my mouth. It risks hinting at an unspoken rule that only dumb animals may be slaughtered for human food consumption. By doing so, the film opens the door to speciesism and risks preying upon our own willingness to practice it.